A little over two years ago Bentley Motors stunned the world by unveiling a Grand Tourer masterpiece, the Continental GT coupe. Now, only 12 months after the first deliveries of that extraordinarily successful car, we are proud to announce the arrival of the fastest four-door in the company's history; a car that shares the heart and soul of the 198mph coupe from which it is born - the Continental Flying Spur. The Continental Flying Spur combines the exquisite design and peerless craftsmanship for which Bentley is renowned with the dynamics and power of the Continental GT to provide an unparalleled motoring experience that will attract a new breed of discerning customers to the marque. Throughout our history, Bentleys have offered a blend of luxury and potent performance. The ability to undertake long journeys in great comfort has been the hallmark of every Bentley, and never was that better demonstrated than in the iconic R-Type Continental from 1952 and its four-door descendant, the Continental Flying Spur. Bred from the fastest four-seat coupe of its time, the original 1957 Continental Flying Spur was hailed as one of the most elegant and yet powerful saloons ever created. The new Continental Flying Spur continues that Bentley bloodline of sporting Grand Tourers. Similarly inspired by the most desirable coupe of its day, it delivers awesome performance as well as extraordinary comfort and elegance. Like the original Flying Spur, the new Bentley is also purposely positioned as a premium product above a crowded market. When asking our future customers about their needs they were very clear - performance and luxury, style and practicality, inspiration and solidity, excitement and safety. The Continental Flying Spur is our response to their 'no compromise' attitude, and our desire to further the Bentley story. - An all-new four-door Grand Tourer that blends peerless Bentley craftsmanship and design with modern technologies. - Exhilarating supercar performance thanks to a top speed in excess of 305km/h (190mph) and a 0-100km/h (62mph) time of around five seconds. - Powered by a 6-litre, twin-turbocharged, 12-cylinder engine engineered and built at Bentley's factory in Crewe. Tuned to provide not just a massive 552bhp but also the legendary Bentley 'torque' from low revs. - A high-tech, all-wheel-drive system for exceptional stability and grip in any conditions. - A stunning cabin that uses exquisite Bentley design and quality to create a spacious, welcoming interior. A classic mix of leather and wood veneers are combined to give a contemporary but timeless appearance. - Over 11 leather hides are used to make a complete set of upholstery in the Continental Flying Spur. - Spacious rear legroom provides total comfort for all passengers with a five or four-seat layout optional at the time of purchase. - Designed and developed in parallel with the Continental GT coupe at Bentley's design studios and facilities in Crewe to ensure consistency in their visual appearance and in their on-going engineering and development programme. - Pricing for the new Continental Flying Spur is yet to be finalised but Bentley expects a similar price structure to that of the Continental GT coupe. 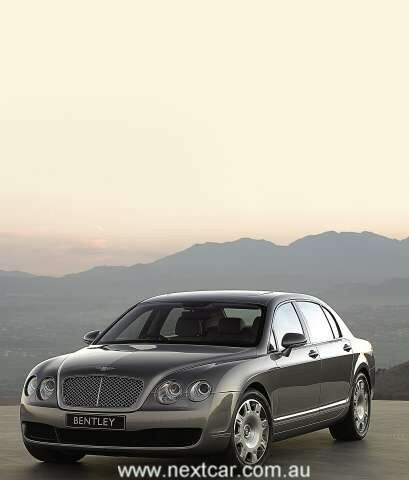 - The new Bentley Continental Flying Spur will go on sale in the northern Spring 2005. When work began on the Continental GT coupe in 1999, a simultaneous programme was instigated for a four-door version that would mirror the performance and design qualities of the coupe and also provide unparalleled levels of space and comfort in a way that only a Bentley can. The results of that forward-thinking approach are now clear as the Continental Flying Spur is unveiled for the first time. Sumptuous levels of space and comfort are a given in the Continental Flying Spur. The quality of the overall design and cabin interior is simply without rival and only another Bentley can match the craftsmanship that has gone into making this elegant and opulent four-door Grand Tourer. These clear and simple targets were laid down to Bentley's head of design, Dirk van Braeckel, when the project began, and he made sure that they were not forgotten as the car's form began to take shape. "We were very conscious that the Continental Flying Spur had to make a sporting statement when people first saw it - after all it is a Bentley," says van Braeckel. "That's actually more challenging with a four-door than a coupe, which will always look 'fast', so we spent a long time working on an appearance of potency while still retaining the presence and stature that customers expect from our cars." A sporting statement, however, was not the sole target for the car's design. It also needed to reflect Bentley's evolving modern image, retaining the understated but bold feel that its design team believes has carried Bentley forward throughout its history. "From the very beginning, Bentleys have been quite reserved when it comes to design," says van Braeckel. "It has always been recognised that Bentleys are much less ostentatious than rival cars of a similar price. The new Continental Flying Spur embodies that Bentley ethos of understated elegance." The Continental Flying Spur consequently shares the clean and muscular appearance of the Continental GT coupe with a short front overhang and dominant matrix radiator grille. Inside the cabin, the car has a similarly stunning appearance with a beautiful interior that will stand as a benchmark thanks to its quality and craftsmanship. The generous wheelbase of the Continental Flying Spur's chassis means spacious rear legroom for passengers and an impressive canvas on which Bentley's interior design team could set to work. Customers will have the option of a four-seat layout with a central console between two electrically-powered rear seats or a five-seat cabin with full-width rear seat. Throughout the interior, familiar Bentley trademarks make their presence felt with bullseye ventilation outlets and organ stop controls in the front and rear. Leather or wood veneers on every interior surface combine to give a traditional yet contemporary environment for the driver and passengers alike. Continental Flying Spur owners will want for nothing, whether behind the wheel or enjoying the ride as a passenger. The car is equipped with the latest cabin technology from its advanced infotainment system to its four-zone climate control. Chairman Dr Franz-Josef Paefgen was determined that buyers of this new Bentley would immediately appreciate the generous standard specification. 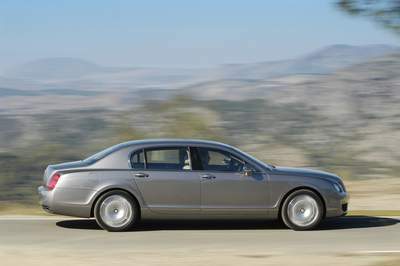 "The Continental Flying Spur has all the technology and equipment that our customers want and need," he says. "They will not have to trawl through an options list for hours with their dealer because everything is included. What they will enjoy, however, is the experience of tailoring the car to their taste and style. "As well as delivering excellent performance and dynamic handling, the Continental Flying Spur offers elegant styling and craftsmanship with its beautiful wood and leather cabin, delighting customers as only a Bentley can." With 552bhp at your disposal and an advanced all-wheel drive system to ensure that power is delivered in a controlled and measured fashion, the Continental Flying Spur has the performance to match its appearance. As with every Bentley, this is a driver's car first and foremost. In common with the Continental GT coupe, the car's extremely stiff steel chassis allows the advanced air suspension system to regulate safely the handling and balance of a four-door with supercar performance: a top speed in excess of 305km/h (190mph) and 0-100km/h (62mph) in around five seconds. However, such is the breadth of its dynamic capability, the Continental Flying Spur also delivers supreme comfort for long, relaxed journeys. "Over the course of its development the car was subjected to a rigorous drive programme that saw it complete nearly a million miles on proving grounds, test tracks and roads across the world," reveals Dr Ulrich Eichhorn, member of the board, engineering. "The result is a car whose breadth and capability, in any weather, on any road surface, is simply awesome." Bentley's renowned powertrain development was rightly praised at the launch of the Continental GT coupe and the combination of that phenomenal twin-turbocharged, 12-cylinder engine with a smooth, six-speed 'paddleshift' ZF gearbox with Tiptronic actuation is carried over into the Continental Flying Spur. A Bentley engine is unlike any other in the world and the Continental Flying Spur's is no exception. Maximum torque is available from just 1600rpm and continues unabated throughout the powerband, meaning the driver can call upon exceptional reserves of power in an instant. The Continental Flying Spur's permanent all-wheel drive system ensures that even in poor weather and road conditions, the awesome power and torque remain accessible to the driver without the constant intervention of the traction control system. The advanced six-speed transmission allows the driver to use the gearbox as a conventional automatic or opt to change gears 'manually' using either the gearlever or the paddles mounted behind the wheel. Whatever mode the gearbox is set to, the powertrain operates with seamless efficiency and provides brilliant shift quality. In its four-door application it has also been extensively recalibrated to provide almost imperceptible shifts when being used in a more relaxed fashion. The Continental Flying Spur perfectly complements the existing range of Bentley models. The Continental GT continues to fulfil our customers' desire for a dynamic coupe that offers the very essence of Bentley: sporting prowess and Grand Touring performance. Similarly the Arnage range represents a unique proposition: the emotional purchase of a truly bespoke, hand-built and entirely individual limousine. The Continental Flying Spur will appeal to customers seeking a sumptuous four-door Grand Tourer sharing all the virtues of its coupe stablemate: high-performance, timeless design and superb craftsmanship. "As Continental Flying Spur production begins, the Arnage will retain its true position as the most exclusive limousine in the world. If you work in a major capital city you might see a Continental Flying Spur a few times a month, but you will only come across an Arnage a few times a year. The Arnage will continue to be a bespoke car with real exclusivity. "With the Continental Flying Spur we are opening our doors to new customers who value that unique combination of luxury, style, excitement and practicality. Nowhere else will they be able to enjoy a car that possesses all this as well as the dynamic qualities and power of the Continental GT coupe. The Continental Flying Spur promises a new motoring experience and we look forward to welcoming a new breed of discerning customers to our marque." SUBSCRIBE to our free newsletter here. Simply send a blank e-mail to lodge your subscription.